Home / Curious about coffee? / ….How Does your Garden Grow? 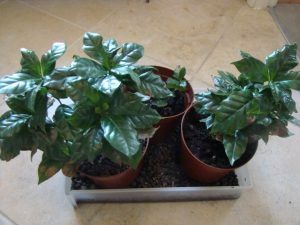 We had a customer recently in The Coffee Den who was telling us about his success growing a coffee plant as a house plant. 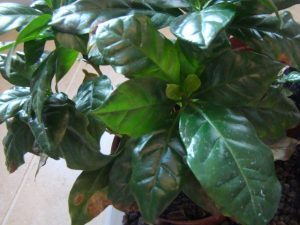 It did eventually flower and each year he would harvest about 40 grs of coffee! 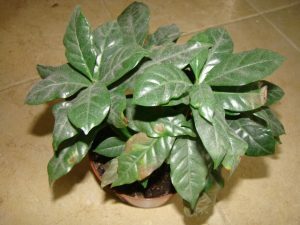 This story pricked my conscience and later that day I took a good look at my plants. 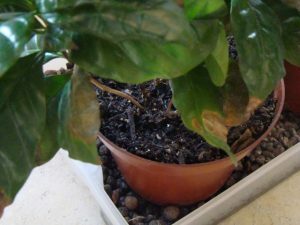 I must confess that I have neglected the plants somewhat, and as a result there appears to be quite a lot of brown dried up leaves. This I hope is as a result of less than consistent rainfall which the plants thrive on in their native growing environment. In their current environment it means I’ve been rather slack in the watering department, despite walking past the plans at least twice a day! However on a more positive note they do seem to continue to throw out new shoots at the top of the plant …. so not dead yet!! With renewed enthusiasm I set to and wiped the dust from the leaves so that once again they were evergreen! There are 5/6 leafy stems in each pot and I’m unsure as to how many one would remove – if any? I decided to thin out a few of the stragglers that were being over shadowed. I have re positioned the plants so that they will be consistently warmer and benefit from a little sunshine, I’ve also been spraying them with water trying to re create the rainfall effect …not entirely sure this is necessary but it feels satisfying!! Only 1 1/2 years to go until the possibility of flowers appearing! Sign up to our newsletter for promotions, special offers, useful hints, tips & how to's.